of 2016. Occupancy rates have continued to grow, as the vacancy rate dropped 30 basis points from the prior quarter to 11.0% this quarter. This represented over a million square feet in new occupancy. Vacancy rates remains 270 basis points below the peak in the second quarter of 2013. 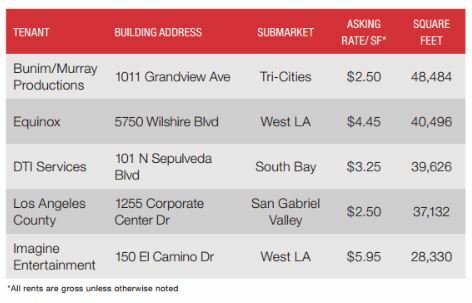 Average asking office rents have increased 5.6% over last year to $2.85/SF. Year to date total leasing and sales activity is 11.1 million square feet, which is a decline of 12.5% compared to last year. This signifies a tightening market with a tepid new demand in a marketplace that increasingly favors landlords. The average price for office space has risen to $388/SF, representing a 10.5% increase since the second quarter of 2015. This comes as investors have poured tens of billions of dollars in new construction in Downtown Los Angeles and the Westside. Total nonfarm employment in Los Angeles County has added 101,000 jobs, representing a growth of 2.4% over the past year. Employment growth in Office occupying sectors saw 2.4% growth over the past year with the Information sector seeing the largest growth with over 5,900 new jobs added. The availability of sublease office space continues to increase in Los Angeles County. It is up 2.3% from the prior quarter and 17.8% from last year. As space sits on the market longer, sublessors are going to be motivated to drop rates heading into the second half of the year. New supply is underway as several projects are slated to be delivered in 2017, with the majority of these new projects being delivered on the Westside and Downtown Los Angeles, including the Wilshire Grand Hotel and the Ford Building. The Los Angeles office market saw more than 5.5 million square feet of space leased this quarter. While leasing activity slowed slightly over the year, dropping about 17.0%, it is up 2.1% from the prior quarter. Rental rates have continued to increase, growing by 5.6% over the year. In addition, the average asking rent for sublease office space is growing at a larger rate. The monthly average asking rent for sublease office space increased 7.1% over last year. 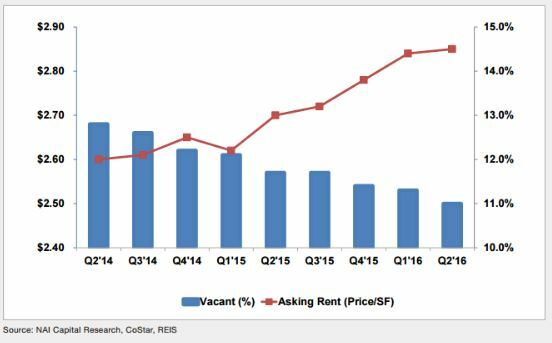 This quarter, the average asking rent for sublease office space was $2.73 SF, representing a 4.4% discount when compared to the average asking rent for direct space. In one of the larger deals of the quarter, Bunim Murray Productions rented 48,484 square feet in Glendale for an asking rent of $2.50/SF. Similarly, Equinox leased 40,496 square feet in West Los Angeles for an asking rent of $4.45/SF. There has been significant sales activity in Downtown Los Angeles, as investment firms have taken notice popularity of downtown and have begun purchasing larger properties. Sales activity has increased by nearly three times over the last year’s total, with significant activity in the Downtown area and LA’s Westside. H.I.G. Realty Partners purchased 733,000 square feet of Class A office space in Downtown Los Angeles at 1200 W 7th Street for $278/SF. This is the first time that this building has been sold after its construction, indicating high demand for Class A office property. Similarly, GLL Real Estate Partners, Inc. purchased 701,535 square feet of Class A office space at 400 S Hope St for $447/SF. Also, Granite Properties, Inc. purchased 304,503 square feet of office space in Glendale for $262/SF. Special thanks to JC Casillas and his market research team at NAI Capital for this report. For any of your real estate questions, please contact me.